Nikon Coolpix S10 features 6 megapixels 1/2.5-inch type CCD, Nikon’s new Image Sensor Shift VR (Vibration Reduction) to correct and minimize the effect of undesired camera shake or movements, 10x swivel design or tilting optical Zoom-Nikkor glass lens (equivalent to 38 – 380mm in 35mm), 2.5 inch LCD screen with 170-degree wide viewing angle, ISO sensitivity of up to 800, Nikon In-Camera Innovations which include In-Camera Red-Eye Fix to automatically remove most instances of red-eye in the camera, Face-Priority AF face-finding technology that automatically finds and focuses on face(s), and D-Lighting which lightens dark images, in-camera, for great prints right out of the camera. Other functions include Pictmotion which creates in-camera slide shows with music, USB support, Pictbridge compatible, external SD flash card slot, and movie capture capability. Tech Digest (dead link) reviews Nikon Coolpix S10 and concludes with rating of 3 out of 5 that Nikon CoolPix S10 clearly falls into the point-and-shoot category as it offers little for skilled photographers to get their teeth into. If you’re not concerned with tweaking all your settings manually then there are at least a wide range of well organized scene modes to help you along, but the long focus times may prevent you from getting some of the most natural poses you’re trying to snap. Coupled with the swivel design that is also going to be a love hate affair. And, the price seems just a little too pricey. Imaging Resource picks Nikon Coolpix S10 as Dave’s Picks with comment that “shooting with the Nikon Coolpix S10 was fun. The camera never got in the way, and often deftly avoided obstacles that would cause other camera designs to miss the shot. The 10x Nikkor zoom lens makes the Nikon Coolpix S10 an exceptional swivel. It does exhibit some chromatic aberration at both wide and telephoto ends of the zoom range, but we thought it was kept under control, probably thanks to Nikon’s use of ED glass in the Coolpix S10. ISO 800 shots were only usable at 4×6, but the ISO 50 shots were quite good at 11×14. And the special Nikon-only features included will all come in handy as you use the camera. TrustedReviews concludes overall rating of 5 out of 10 that Nikon Coolpix S10 is a well-made and attractively finished camera with some useful capabilities, excellent noise handling and is capable of producing good results under the right circumstances. However, lackluster performance, terminally slow AF, poor low-light capability and awkward handling limits its appeal. It is also expensive compared to rival cameras with superior performance, so the overall outlook is bleak. photokina concludes that the new Nikon Coolpix S10 which is the successor to the Nikon S4 has the concept has remained the same; the tilting lens is and continues to be an ideal feature of the camera. You can take a picture from practically every angle and this gives users enormous scope to make creative photographs. The 10x optical zoom lens has a large range of 38 – 380mm with which you can capture any subject with no limitations. The added value of the image stabilizer is the direct adjustment of the CCD image sensor. The effectiveness of this sort of image stabilization system is such that it can make the difference between a successful picture and the digital rubbish bin. In addition to this, intelligent software like D-lighting, Pictmotion and the automatic red-eye correction makes it very user-friendly. 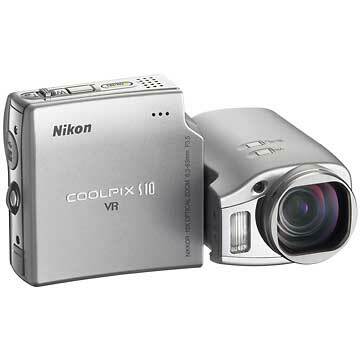 The Nikon Coolpix S10 distinguishes itself in this area. The Nikon S10 is a compact Megazoom digital camera for amateur photographers that give them the chance to take creative photographs without immersing themselves in photographic techniques. DCRP concludes that “while not for everyone, the Nikon Coolpix S10 is a unique point-and-shoot ultra zoom that earns my recommendation. It makes some significant improvements over its predecessor, the Coolpix S4, adding image stabilization, a stronger flash, a sharper LCD, and more. It’s not without a few annoying flaws, though. If you want a fairly compact ultra zoom camera that can take some creative shots, then the Coolpix S10 is probably worth a look. If you want manual controls and lens accessories then it’s probably not the best choice. For more features, specifications, sample images or firmware updates, visit Nikon Coolpix S10 official homepage (no longer available).